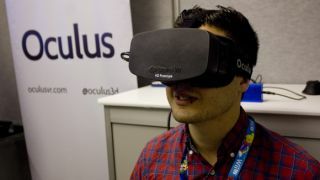 Oculus Rift is setting its sights on the PC for now, but although the PS4 and Xbox One are almost out the door, their potential relationship with the virtual reality headset is currently uncertain. Brendan Iribe, Oculus Rift CEO, told OXM that the while they would like to see Oculus become compatible with the new consoles down the line, their long lifecycles are a cause for caution. "You're going to see rapid innovation, and one of the concerns that we do generally have around consoles is that their life cycles are getting longer all the time," he said, "it's a seven to eight year lifecycle, and in eight years, VR is going to be insane. Incredible"
There are already concerns that the PS4 and Xbox One could be outperformed long before the end of their lifespan. Oculus clearly has big ambitions, but there's always the chance it could play nicely with the new consoles down the line. "There's no reason it can't technically work, it's just getting everybody involved," said Iribe. "Right now we're focused on the PC platform and Android." According to Iribe, the answer is for the big names to invest in their own alternatives. "I hope one or both of the console guys make VR headsets, or something similar, like an AR headset," he said. "The more that they push into this space, even if it's a different device, or their own device, a different experience, the more that they're throwing into AR and VR, the better it is for everybody." Having played with Oculus Rift, we can see that VR technology is finally ready to take off. Let's just hope that everyone else is ready to get on board too.